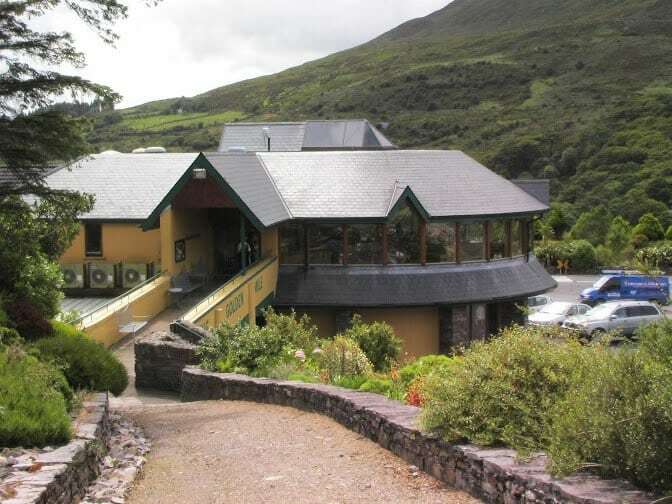 Goldens of Kells, The Quarry Restaurant and Gift Shop is a family run business and an ideal place to take a well earned break on the world famous Ring of Kerry and Wild Atlantic Way scenic drives. The Quarry Restaurant is located above the Craft shop serving Breakfast, Lunch, illy Coffee and light snacks such as scones, cookies and tarts with some of Ireland best scenic views across Dingle Bay to the Atlantic Ocean. We are located half way between Glenbeigh and Cahersiveen Town. We also provide a filling Station, Bureau De Change, Tourist Information point, Food Store, Nature Walk and Pats Craft Shop which stock Top Quality Irish Crafts alongside world renowned brands such as Donegal Tweeds, Waterford Handmade Glass, Target dry and Beleek China to name but a few.